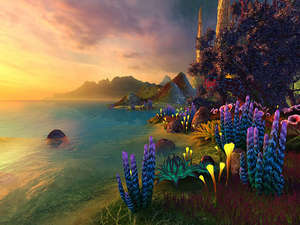 Faraway Planet 3D is an application designed to provide users with a Science Fiction landscape of an alien world populated with many different types of colorful plants. The screensaver is well designed and textured having an atmosphere that will make it even more realistic and which will enhance the eerie feeling one would expect to have when visualizing an alien planet. A screensaver manager is also included which allows not only the easier use of any 3Planesoft screensaver but also the setup of the screensaver with settings such as video resolution, music background and sound effects. Faraway Planet 3D does require more than just a regular office PC configuration in order to run at maximum resolution with a good frame rate, a 3D accelerated video card being more than welcome when it is running. Faraway Planet 3D Screensaver 1.0 is a shareware program and can be used as a demo to try the software until the free trial period has ended. A full version of the program is available after the trial period ends. For security reasons, you should also check out the Faraway Planet 3D Screensaver download at LO4D.com which includes virus and malware tests. Additional screenshots of this application download may be available, too. Faraway Planet 3D Screensaver has a presence on social networks.